Can a carp jump a waterfall to become a dragon? What stops us from becoming what we want to be? A legend says that carp able to leap over the Dragon Gate would become dragons. Several waterfalls and cataracts in China are believed to be the location of the Dragon Gate. This legend is an allegory of the drive and efforts needed to overcome obstacles. The text for this film is based on a Chinese myth found in the writings of Nichiren Diashonin ‘The Dragon Gate’, with a line based on ‘Return to Love’ by Marrianne Williamson. 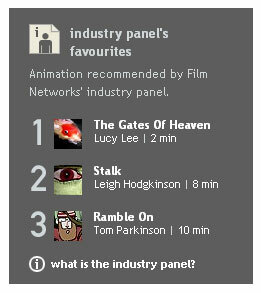 BBC Film Network (listed no.1 on the Industry Panel’s Favourites in September 2006). Add your own review if you are a member. Canadian Film Centre’s Worldwide Short Film Fest. The fish were filmed on mini DV then broken down as single frames, hand painted over each frame in both Photoshop and then Painter. Then strung together again as a ‘9 frame dissolving’ sequence. The waterfall was done the same way, but then laid over a scan of an ink painting on canvas. Mist effects are dissolving png layers in After Effects. The birds are hand drawn on paper, scanned then hand painted in both Photoshop and then Painter. The whole film including pulling the idea into shape, production, sound and post production took just 6 weeks. The sound was written recorded and mixed by Sam Sutton at www.noisecreative.com.